In 1878, in the area where I now live, a house was being demolished and a secret room was found. Inside, a witch’s ladder was discovered, an armchair and six broomsticks. The ladder was made of knotted cord, with feathers woven in to it. It was used to cast a death spell. The local area is famous for the witch trials of 1664, when Sir Richard Hunt, JP, presided over a trial of seventeen people, six of whom were men, four of whom were husbands of accused women. The trial followed a zealous eight year hunt, during which victims were arrested and confessions were extracted by torture, along with ‘evidence’ such as blemishes, birthmarks and spots. These areas were pricked by professional witch finders armed with bodkins to see if the ‘witch’ felt pain. Interestingly, ‘prickers’ could earn up to twenty shillings for finding a witch, so the use of retractable needles was prevalent. There was widespread victimisation. It was easy for a woman to be accused: someone would blame her for any ailment or local tragedy and hysteria would follow, evidence would be contrived and the woman would be thrown into a river, hanged or disposed of in a variety of other dreadful ways. Many innocent women were targeted: the elderly, anyone who lived outside the community, even someone who owned a pet would be under suspicion. Incidents such as accidents of weather, petty jealousies, unfortunate deaths would result in a poor unfortunate being singled out for blame. Wise women, healers, herbalists and midwives were often met with mistrust. The last witch to be ‘discovered’ in the county in which I live was in 1707. The Witchcraft Act was repealed in 1735. The death penalty for witches was replaced by penalties for the pretence of witchcraft. Attitudes had started to shift. We consider Hallowe’en to be an exciting and imaginary night when witches venture during the night to wreak final havoc before All Hallows’ Day on November 1st. But old attitudes still prevail. On 31st October, ‘Secret midnight hags’ are said to roam at large and images of witches usually fall into one of two simple stereotypes: crone or temptress. 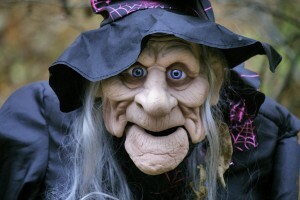 The old witch with a hooked nose, warts, straggly grey hair and a broomstick is renowned. It appears that it’s still acceptable to view old women as hags. We have a problematic attitude to age in our society. Phrases like ageing population don’t help. Adverts bombard television screens with creams and cosmetics which claim to reduce wrinkles The expectation that we can turn time backwards and the belief that being older is unattractive doesn’t support the idea that people can grow old and still be worth looking at. Prejudice towards the old is not only rife, but it’s not yet entered the pc radar sufficiently to become the contentious issue it should be. Old people are viewed as less active, feeble even, both mentally and physically. Their contribution is marginalised, as if younger people can do everything better. Which is not to say that young people can’t excel – it is the widespread assumption that age means that people are past their best which is erroneous. Look at adverts on television. Older people seem only to be represented when someone is selling pension, retirement and funeral plans. Actors are silver haired, smiling and bland. Nothing defines them other than just being old. Not sage, not experienced, not – God, forbid – interesting, attractive, intelligent, with a sense of humour or an opinion. Just old. And a bit doddery. I researched attitudes to older people, and the ‘cut off’ point from young to old was interesting. People above 50 were deemed to be ‘old’ generally. People above 35 were ‘ageing’ when it came to mental or physical prowess or fitness, as their ability was already believed to be diminishing. Yet I know of people much older than 50 who are athletes, students, thinkers, geniuses. Lovely people. I fail to see why age is an issue at all in many cases. Age is a blessing. Isn’t the point, though, that we all want to grow old? We don’t want to die prematurely. We are struck with horror when someone passes before their time. We all have a right to hope for our four score and ten – or much more now, in this age of medical science, prevention and cure. We all want to live to a ripe old age. We want to be as physically and mentally strong as possible, to work, to create, to be active, to be attractive even and, certainly, we want to be able to have a laugh with our grandchildren, help them with homework and beat them at paintball and drinking competitions. So, why all the denigration of old people when that is exactly what we all aspire to being? I’m wondering how far we have come since the witches were hunted and shunned? An old lady in her cottage, alone with her cat, her fingertips blessed with healing skills and a sound knowledge of potions was viewed with suspicion and then she was blamed for every natural disaster. Now, perhaps, a similar old woman is ignored, ridiculed and viewed as a member of the ageing society, a burden on the state. That’s a long way from the respect older people – all people – deserve. It’s about time we treated others with care and empathy rather than wrongly assess the cost of their usefulness to us and then shove them to one side. 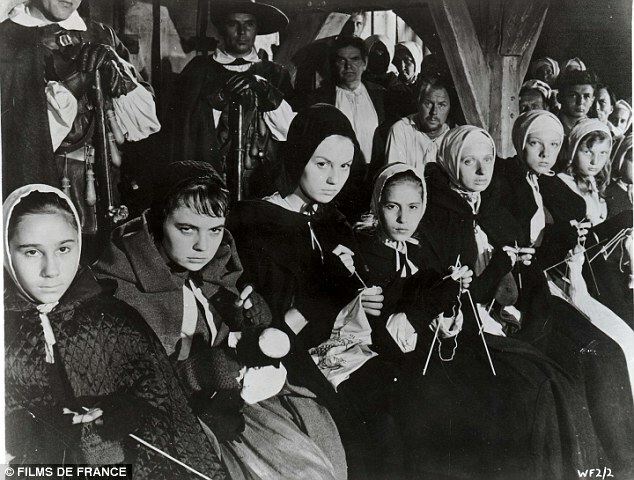 That was also true of the convicted women in the trial in 1664. Blamed, victimised and then forgotten. I have affection, an affiilation even, with the women who healed and charmed, who harnessed the powers of nature four centuries ago, followed as they worked by a lone black cat. I wonder what they would think if they were able to visit the 21st century. I wonder if tmodern ageing counterparts are treated with more respect and dignity. Perhaps if they were here now they’d blend a potion to redress the balance and dispel the continuing prejudice. It’s a nice thought. Is there a novel in all of us?